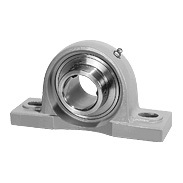 *Bearing unit consists from block with mountable bearings. *Insert Ball Bearings are designed in almost the same way as deep groove ball bearings,except that the outer ring is spherical. Their design allows the bearings to be easily mounted in a housing block and be self-aligning. You can search by the code fragment, or manufacturer, then you will be provided with all possible options. Enter code, code fragment, or manufacturer. NSK manufactures several ranges of mounted units. These include the RHP Self-Lube®, our recognized standard, and other specialty ranges such as Silver-Lube®, Life-Lube® and Molded-Oil™ units. In each type, there are two basic components, the insert and the housing.NSK mounted units consist of a sealed single-row ball bearing with spherical outside diameter and extended inner ring mounted in a pillow block or flanged housing. 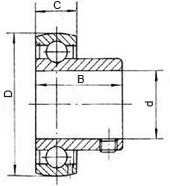 The spherical fit accommodates initial misalignment. This product is available with a range of locking methods for cosy shaft mounting and this combined with a complete range of sealing for all environment make this a very versatile product. • Two-piece riveted high strength metal cage in steel or stainless steel. • Spherical seating to allow for initial misalignment on mounting. • Re-lubrication facility as standard. Molded-Oil™ options do not require relubrication. • Super finished raceways for quiet and efficient running. 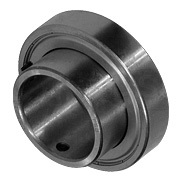 • Protector for added bearing protection and safety. Available in steel for Self-Lube® units or plastic for Silver-Lube® units. • Inner and outer rings through hardened, high quality steel. • Rigid one-piece high quality cast iron housing. Also available in high quality thermoplastic or cast stainless steel. • Proven single lip seal, triple lip seals and flingers also available. • Set screw shaft locking, eccentric collar and taper sleeve lock also available as standard. HLT inserts available and designed to operate reliably at extreme temperatures.